Gabriel Allan Tuft (born November 1, 1978) is an American retired professional wrestler. He is best known for his tenure with WWE under the ring name Tyler Reks. He has also competed in WWE's developmental territory Florida Championship Wrestling, where he held the FCW Florida Heavyweight Championship once and the FCW Florida Tag Team Championship twice, once with Joe Hennig and once with Johnny Curtis. Since retiring from wrestling, Tuft works in marketing. He also launched a fitness website with several other wrestlers. Tuft attended the Santa Rosa Junior College in Santa Rosa, California from 1996-1999 and then transferred to the California Polytechnic University in San Luis Obispo (Cal Poly-SLO) in 2000. There he completed his coursework and obtained a degree in civil engineering with a major in hydrology and structural engineering. After graduating, Tuft secured a job as an assistant engineer at PBS&J in Encinitas, California. He was staffed at the City of Dana Point as an extension of staff and was in charge of the Public Works Permitting Department. Tuft was trained by Mike Bell. He made his professional debut in February 2007 for Ultimate Pro Wrestling. Tuft was signed to a developmental contract with World Wrestling Entertainment in January 2008 and was assigned to the Florida Championship Wrestling territory as Tyler Reks. He made his FCW debut on February 5, 2008 with Johnny Curtis in a losing effort against Eric Pérez and Eddie Colon. A few days later on February 12 he made his singles FCW debut in a losing effort once again against "The South City Thriller" Hade Vansen. He participated in a FCW Florida Heavyweight Title Battle Royal which was won by Jake Hager. He also took part in FCW Florida Tag Team Title Tournament with Rycklon, during this tournament he had his first victory at FCW defeating Ted DiBiase, Jr. and Afa, Jr. in the first round, however the pair were to lose Eddie Colon and Eric Perez in the quarter finals. Tuft then had two chances at FCW Florida Heavyweight Championship against the current champion Jake Hager first in a one on one match and then in a triple threat match along with Johnny Curtis. On the August 28 he participated in FCW Florida Heavyweight Championship No. 1 Contendership Fatal Four Way along with Johnny Curtis, Tyrone Evans and Sheamus O'Shaunessy, who went on to win the match. Tuft then went on to have another two FCW Florida Heavyweight Championship shots against Sheamus O'Shaunessy and lost both times. On December 11, 2008, Reks and Johnny Curtis defeated The New Hart Foundation (DH Smith and TJ Wilson) to win the Florida Tag Team Championship in Tampa, Florida. After numerous defenses and 139 days of holding the titles they lost them to Caylen Croft and Trent Barreta. Tuft won FCW Florida Heavyweight Title No. 1 Contendership match and on June 11, 2009, he captured the Florida Heavyweight Championship by defeating Drew McIntyre. He later lost the title to Heath Slater at the FCW television tapings on August 13. He later lost to Slater again during his rematch for the title. He lost to Joe Hennig in a FCW Florida Heavyweight Title No. 1 Contendership match and lost a FCW Florida Heavyweight Title No. 1 Contendership battle royal. He and Leo Kruger had a FCW Florida Tag Team Title match against Epico but lost. He made his main roster debut on ECW on Sci Fi on the June 30, 2009 episode, with a surfer in-ring persona, in a backstage promo with Zack Ryder. Reks had suffered a knee injury just prior to his debut, but was able to work through it and made his in-ring debut on the July 2, 2009 episode of WWE Superstars, losing to Ryder. On the July 21 episode of ECW, Reks gained his first win after defeating Paul Burchill, and then beat him again the following week. Reks participated in a 10-man battle royal on the September 15 edition of ECW for an ECW Championship opportunity against Christian, but the match would go on to be won by Zack Ryder. Tuft would begin a brief hiatus from television starting in November 2009 and began mainly working dark matches and house shows for both Smackdown and Raw and FCW matches. Reks was one of the participants in the 26 man pre-show battle royal at WrestleMania XXVI. In late April 2010, Reks joined the SmackDown roster following ECW's closure. After months of only working dark matches, Reks made his SmackDown television debut as a heel on the October 15 edition of the program while sporting a beard, chest hair and new attire in addition to never referencing to his time on ECW. After a promo, he challenged and successfully defeated Kaval in a match for the latter's spot in the SmackDown Bragging Rights team. On the Raw before Bragging Rights, he participated in a SmackDown vs. RAW 30 Man Tag Team Battle Royal, in which Smackdown was victorious. At Bragging Rights, Reks was able to eliminate Santino Marella before being eliminated by Sheamus. However, Team SmackDown was successful in winning the Bragging Rights Cup for the second consecutive time, which would end up being Reks' most significant accomplishment in his WWE career. After this, Reks was placed in Alberto Del Rio's Survivor Series team and at the event. On the Smackdown before Survivor Series 2010 he competed in a Ten Man Tag Team Battle Royal but his team lost. At Survivor Series 2010 he was eliminated by Kofi Kingston as Team Del Rio went on to lose the match to Team Mysterio. Reks was then moved into a feud with Chris Masters, defeating him once on SmackDown and twice on WWE Superstars. On January 30, 2011, Reks made his Royal Rumble debut as he entered the match as the sixteenth entrant, but was eliminated from the match in only 34 seconds by CM Punk and the New Nexus. Reks was involved in another dark battle royal at Wrestlemania 27. Reks participated in and lost a World Heavyweight Title No. 1 Contendership 20 Man Battle Royal. His last in ring television performance for five months would be beating JTG on Superstars. Reks with his partner Curt Hawkins. On April 26, Reks was drafted to the Raw brand as part of the 2011 Supplemental Draft. After wrestling dark matches for a few months, Reks made his Raw debut in a backstage segment with Curt Hawkins, Wade Barrett and Alberto Del Rio. On the September 8 edition of Superstars, Reks made his in-ring return as he teamed with Hawkins to defeat Titus O'Neil and Percy Watson. Hawkins and Reks then began appearing on the fifth season of NXT, by attacking the Usos from behind on the September 27 episode NXT. Over the next two weeks on NXT, Hawkins and Reks faced the Usos in tag team matches, with Hawkins and Reks winning the first match and the Usos winning the second match. Reks made his singles return on October 16 losing to Yoshi Tatsu. Reks participated in a World Heavyweight Championship number 1 contender 41 man battle royal and the "All I Want For Christmas Battle Royal" and was eliminated in both. Hawkins and Reks would lose to The Usos once again on December 6. Reks and Hawkins would then lose a non-title match to the tag team champions Air Boom on the December 22 episode of Superstars. Hawkins and Reks would feud with the duo of Trent Barreta and Yoshi Tatsu from December 2011. Both teams would play pranks on each other, with Tatsu being locked in a closet and Reks' hands being superglued onto an Xbox controller. The feud ended when Hawkins and Reks defeated Barreta and Tatsu on the January 18 episode of NXT. Hawkins and Reks would then settle into the role of NXT's troublemakers, tormenting NXT host Matt Striker on his lackluster career and how they should be main-eventing NXT, even once going to the extent of assaulting him after a match. This forced Striker to appoint William Regal as NXT's prime authority figure on the February 29 episode of NXT. Regal would employ harsh measures to keep Hawkins and Reks in line, including threatening suspensions for bad behaviour and condemning them to janitorial duty, this caused them much frustration. On the March 21 episode of NXT Redemption, Striker was knocked out with chloroform by Johnny Curtis and Maxine, and then Striker was kidnapped (kayfabe) by unknown persons, later revealed to be Hawkins and Reks, who intended to blackmail Maxine into using her charms to get Regal to leave them alone. Unfortunately for Hawkins and Reks, Striker was rescued by Derrick Bateman and Kaitlyn. On the April 18 episode of NXT, the freed Striker confronted Hawkins and Reks about the kidnapping, and Hawkins admitted the crime. As punishment, Regal put Hawkins and Reks in a match against each other with Striker as referee and the loser of the match would be fired. Even though Reks won to supposedly save his job at the expense of Hawkins', Regal decided to fire Reks as well, sending the two troublemakers away from NXT. However, Regal could not keep the duo away from NXT for long, as they managed to convince villainous higher authority figure John Laurinaitis to rehire them as NXT's security team on the May 9 episode of NXT. Hawkins and Reks would then continue to play the role of Laurinaitis' lackeys, confiscating anti-Laurinaitis signs at Over the Limit and attacking John Cena on the May 21 episode of Raw. Hawkins and Reks' association with Laurinaitis ended after Laurinaitis lost his job at No Way Out. On the final episode of the fifth season of NXT on June 13, Hawkins and Reks defeated Percy Watson and Derrick Bateman. Hawkins and Reks would then engage in a one-sided feud with Ryback in July 2012. After both Hawkins and Reks lost singles matches to Ryback on SmackDown, Ryback defeated both of them in a handicap match at Money in the Bank. At Raw 1000, Hawkins and Reks, along with Jinder Mahal, Drew McIntyre, Hunico and Camacho, attempted to ambush Kane to make a statement, but a returning The Undertaker interrupted the attack and The Brothers of Destruction disposed of Hawkins and Reks. The duo would once again lose to Ryback on the August 6 episode of Raw. After being told by SmackDown General Manager Booker T to "step it up", Hawkins and Reks debuted a stripper gimmick on the August 17 episode of SmackDown while squashing a jobber tag team. A week later, Reks asked for his release as he intended to retire from wrestling to spend more time with his family; he and WWE parted ways on August 21, thus ending the team. Reuniting with Curt Hawkins, the pair tagged together as part of Pro Wrestling Syndicate picking up a win in September against Kevin Matthews and Lance Hoyt. Reks, together with Curt Hawkins, created an animated YouTube series called MidCard Mafia in 2011, which was quickly cancelled and pulled from the internet after complaints from WWE management. Tuft has been married to his wife, Priscilla since July 2002. They have one daughter, Mia, who was born in November 2011. 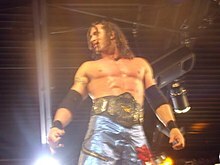 Tuft as the FCW Florida Heavyweight Champion. ^ a b c "California Births". Family Tree Legends. Retrieved February 3, 2008. ^ a b c d e f g h i "Profile". Online World of Wrestling. Retrieved December 24, 2008. ^ a b c d e f g "Tyler Reks Biography". World Wrestling Entertainment. Retrieved April 26, 2010. ^ a b Caldwell, James. "WWE News: Tyler Reks details his decision to leave WWE - was there a breaking point?, will he ever wrestle again? (w/AUDIO)". Pro Wrestling Torch. Retrieved August 31, 2012. ^ "Current And Former WWE Stars Working On New Project, Big Performances For Lilian & Jericho - WrestlingInc.com". wrestlinginc.com. Retrieved March 23, 2018. ^ a b c Kreikenbohm, Philip. "Matches « Tyler Reks « Wrestlers Database « CAGEMATCH - The Internet Wrestling Database". cagematch.net. Retrieved March 23, 2018. ^ "New FCW Champion Crowned, Maria On TV Tonight, More". SEScoops. June 12, 2009. Archived from the original on June 15, 2009. Retrieved August 9, 2009. ^ Martin, Adam (August 14, 2009). "New champion crowned in FCW". WrestleView. Retrieved July 25, 2010. ^ "Florida Championship Wrestling, I mean ECW, TV report". Wrestling Observer/Figure Four Online. June 30, 2009. Retrieved July 1, 2009. ^ Aldren, Mike (July 9, 2009). "Daily wrestling news and gossip". The Sun. London. Retrieved July 12, 2009. ^ Mackinder, Matt (July 2, 2009). "WWE Superstars: Punk's heel turn continues". Slam! Sports. Canadian Online Explorer. Retrieved July 3, 2009. ^ Bishop, Matt (July 22, 2009). "ECW: Dreamer, Christian jabber prior to Night of Champions". Slam! Sports. Canadian Online Explorer. Retrieved July 26, 2009. ^ Parks, Greg (October 15, 2010). "Parks' WWE SmackDown report 10/15: Ongoing "virtual time" coverage of the show, including Undertaker's "return" (again)". Pro Wrestling Torch. Retrieved October 17, 2010. ^ "Team SmackDown def. Team Raw". ^ "Team Mysterio def. Team Del Rio". ^ a b c Kreikenbohm, Philip. "Matches « Tyler Reks « Wrestlers Database « CAGEMATCH - The Internet Wrestling Database". www.cagematch.net. Retrieved March 23, 2018. ^ "KELLER'S WWE RAW REPORT 9/5: Mystery text source revealed, big stips added to Punk-Hunter match at PPV, Zack Ryder record TV time". ^ Bishop, Matt. "WWE NXT: Show becomes tag team anarchy". SLAM! Wrestling. Retrieved November 4, 2011. ^ Tedesco, Mike. "SPOILERS: WWE Superstars for December 22". Wrestleview. Retrieved December 22, 2011. ^ Martin, Adam. "NXT Results – 1/4/12". Wrestleview. Retrieved January 6, 2012. ^ Walek, Gregory. "NXT Results - 1/18/12". Wrestleview. Retrieved April 8, 2012. ^ Walek, Gregory. "NXT Results – 2/29/12". Wrestleview. Retrieved March 27, 2012. ^ James, Justin. "JAMES'S WWE NXT REPORT 5/9 - Week 62: JTG debuts new look, Laurinaitis infiltrates NXT, Overall Reax". Pro Wrestling Torch. Retrieved May 12, 2012. ^ Caldwell, James. "CALDWELL'S WWE OVER THE LIMIT PPV REPORT 5/20: Ongoing "virtual time" coverage of live PPV - Cena-Johnny, Punk-Bryan". Pro Wrestling Torch. Retrieved May 27, 2012. ^ Tylwalk, Nick. "Raw: Big Show sells out and the locker room empties". Slam! Sports. Canadian Wrestling Observer. Retrieved May 21, 2012. ^ Caldwell, James. "CALDWELL'S WWE NO WAY OUT PPV REPORT 6/17: Ongoing "virtual time" coverage of live PPV - Cena vs. Show, potential "firings," who will A.J. choose?". Pro Wrestling Torch. Retrieved June 23, 2012. ^ Caldwell, James. "CALDWELL'S WWE MITB PPV REPORT 7/15: Complete "virtual time" coverage of live PPV - Punk vs. Bryan, Sheamus vs. Del Rio, two MITB matches". Pro Wrestling Torch. Retrieved August 4, 2012. ^ Caldwell, James. "CALDWELL'S WWE RAW RESULTS 7/23: Complete "virtual-time" coverage of live Raw #999 - WWE recognizes 1,000 episodes, WWE Title match, Lesnar, Rock, DX, wedding". Pro Wrestling Torch. Retrieved July 28, 2012. ^ Caldwell, James. "CALDWELL'S WWE RAW RESULTS 8/6: Complete "virtual-time" coverage of live Raw - HBK live appearance, Lesnar in the building, Summerslam hype". Pro Wrestling Torch. Retrieved August 19, 2012. ^ "FCW Florida Heavyweight Championship history". ^ "FCW Florida Tag Team Championship history". ^ "Pro Wrestling Illustrated (PWI) 500 for 2009". Internet Wrestling Database. Retrieved June 8, 2017. ^ "2010 Supplemental Slammy Award winners". Wikimedia Commons has media related to Tyler Reks. This page was last edited on 30 January 2019, at 12:00 (UTC).